It was a simple request on my Facebook account - to taste the thali and post a review. Then came the interesting bit - the thali was just 50 rupees. Really? I've forgotten a time when anything was available for Rs. 50/ and here I was being offered a meal of phulkas, rice, dal, a vegetable and salad for that amount. Sure, I told the young man, and while at it, please make it 2 thalis and please deliver it in time for dinner. The food was to reach at 8pm but at that appointed hour, what I got was a phone call. Directions were given and within the next 5 minutes, he was at my door with 2 plastic bags. Chatting with the young man, we learnt that this catering service called Vaishno Thali, had been started a year ago. Run by 2 brothers, they had a team of cooks from the Uttar Pradesh/Delhi belt and the food was typical of that area. The packaging was neat, the food had been sealed in foil packs. 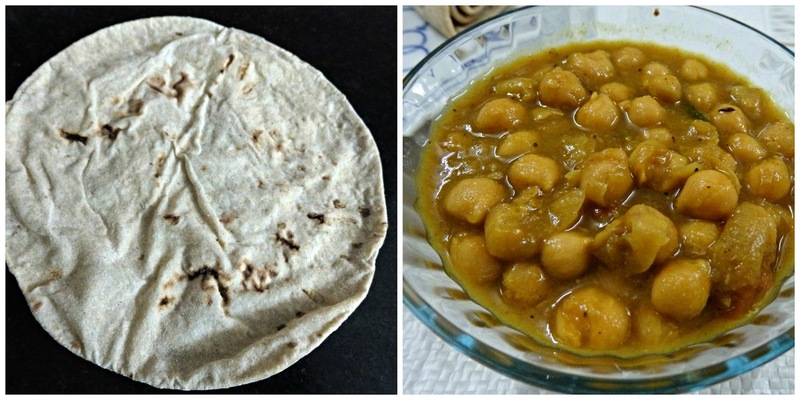 The thali consisted of 4 phulkas, a bowl of chickpeas - chole masala, thin dal and plain rice. There was no salad but there was a little mint chutney. The phulkas, about the size of a handspan, were very soft. The chole that accompanied them was well cooked and had a good balance of flavour and spice. The rice was of a good quality and had been cooked perfectly. I found the dal too watery but am told that is how pulses are served in North India. It had been tempered with mustard and cumin. The mint chutney was also a tad watery and a little spicy. I wasn't sure what it was doing in that thali but it was a good accompaniment to both the chole and dal. I did wish there was a vegetable to square off the meal - 2 kinds of pulses in the same meal was a bit of a protein overdose. We liked the fact that the meal tasted home made. As for the quantity, I think it should be just fine for a hungry bachelor. I shared one portion with the husband and it was enough for us. It was a simple meal and tasted fresh. For that price, it was worth every bit of the cost. Vaishno Thali makes only vegetarian food and a different menu is served everyday, both for lunch and dinner. At times, their menu has stuffed parathas. Instead of the mint chutney, you might find a salad or even raita in the thali. They deliver within a 10 km radius, between Besantnagar and Thuraipakkam.